Aging isn't always pretty, and your mouth is no exception. (Ever consider why you shouldn't look a gift horse in the mouth?) A century ago the need for dentures in later life was almost a foregone conclusion. Today, three-quarters of people over 65 retain at least some of their natural teeth, but older people still suffer higher rates of gum disease, dental decay, oral cancer, mouth infections, and tooth loss. While these problems are nothing to smile about, you can still do a lot to keep your mouth looking and feeling younger than its years. Teeth are amazingly strong. Your molars can bear down with over 200 pounds of pressure. But they're not indestructible. A lifetime of crunching, gnawing, and grinding wears away the outer layer of enamel and flattens the biting edges. Tooth surfaces are also affected by exposure to acidic foods such as citrus fruits and carbonated beverages, which dissolve the protective enamel. Weakened enamel can set the stage for more serious dental problems. A crack or break in the tooth's outer surface leaves the delicate pulp tissue vulnerable to irritation and inflammation. And, since the nerves at the tooth's core lose sensitivity with age, the problem may be well advanced before you notice any pain. If an infection develops, you could need a root canal procedure or even lose the tooth entirely. The chance of having tooth damage severe enough to require a root canal or similarly invasive procedure triples once you're over age 65. The consolation prize: reduced nerve sensitivity means that procedures that may have been uncomfortable for younger people could hurt less if you are older. Just because you've got a few gray hairs doesn't mean you're out of the woods when it comes to cavities, either. The rate of tooth decay in people over 65 now outpaces that of schoolchildren. A prime target of dental caries in older adults is around the neck of the tooth, adjacent to the gum line. Gum tissue naturally recedes with age, so the soft root tissue becomes exposed. In addition, adults who grew up before the advent of fluoride products and dental sealants often have fillings from childhood and adolescence that eventually break down. Decay around the edges of those fillings is also a problem. While there's not much you can do to stem the natural attrition of the tooth surface, the pillars of cavity prevention — brushing, flossing, and regular cleanings at the dentist's office — remain the same at any age. People who have trouble brushing and flossing by hand because of arthritis or other disabilities should probably switch to an electric toothbrush. Fluoride, found in toothpaste, mouth rinses, and tap water in some communities, helps the body rebuild the mineral crystals that make up the tooth enamel and may also inhibit bacteria-laden plaque from adhering to the teeth. Fluoride rinses and gels, and varnishes applied by a dentist, may be able to halt the progression of root decay and in some cases reverse the damage. You may have also noticed that your once-sparkling smile has dimmed over the years. This change is due in part to the yellowing of the dentin inside the tooth that can show through the enamel, especially as it thins and cracks with age. The enamel itself gets stained by coffee, tea, red wine, and tobacco. There's no shortage of whitening products these days. Dental bleaches containing peroxide (available over the counter or through your dentist) will lighten your teeth a few shades, although the results are less dramatic in older teeth. Whitening toothpastes and rinses can temporarily lift superficial stains, but don't expect the effect to last. Before deciding on a bleaching method, it's a good idea to talk to a dentist. Some whitening ingredients, such as carbamide peroxide and hydrogen peroxide, can make teeth sensitive. And the effectiveness of different bleaching techniques can vary with the type of discoloration. Stains caused by exposure to the antibiotic tetracycline in childhood are particularly stubborn and may require several rounds of bleaching to remove. While sturdy teeth are the stars of a healthy mouth, they can't perform without a strong supporting cast — the gums and soft, wet tissue that line the oral cavity. Periodontal disease, characterized by receding gums, wobbly teeth, and deterioration of the jawbone, is the primary culprit in tooth loss among older adults. It gets started when plaque builds up in the shallow trough between the tooth and the gum. Age itself isn't a cause, but the periodontal disease often slowly gets worse and goes undetected — and untreated — for decades, leading to more severe problems in the seventh decade of life and beyond. Fortunately, periodontal disease is treatable at any age with a combination of scaling to remove the hardened plaque and infected gum tissue, antibiotics, and — in advanced cases — surgery. 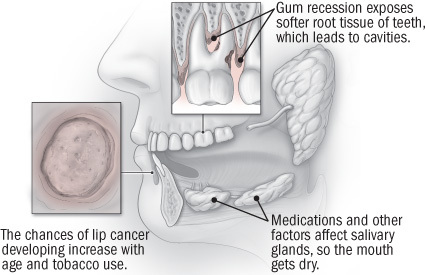 As with many cancers, the risk of developing an oral cavity cancer increases with age and tobacco use. The vast majority of people who get a mouth-related cancer are tobacco users; the likelihood of developing oral cancer rises with each year a person smokes or chews tobacco. The lip is the most common site for oral cavity cancer, followed by the tongue. Most lip cancer tumors grow on the lower lip, and men are much more likely to be affected than women. The initial signs of oral cancer are often subtle and easily missed. You should see an oral specialist if you notice a white or red patch that lasts longer than two weeks, especially if it's on your lip, your tongue, or the bottom of the mouth. Older people are prone to other conditions that cause sores in and around the mouth, including herpes and yeast infections. These conditions are often painful and can interfere with the ability to eat, talk, and swallow. Although benign, they can also be confused with the early stages of oral cancer. Age brings more health problems, and that often means multiple medications, many of which can have a detrimental effect on your oral health. For example, calcium-channel blockers for heart disease and antiseizure drugs can cause the proliferation of puffy gum tissue, particularly around the lower front teeth. Good oral hygiene can combat this problem. In extreme situations, overgrown gums can completely cover the teeth, so they need to be trimmed back surgically. Hundreds of medications list dry mouth (xerostomia) as a side effect. Lack of saliva is more than just uncomfortable. It makes eating and swallowing difficult, causes bad breath, and leads to irritation and infection of oral tissues. It also raises your risk for gum disease and tooth decay; new cavities can begin to form within as little as three months after dry mouth begins. You can moisten a dry mouth by chewing sugarless gums or sucking on sugarless candies. Simply drinking more water can help; try holding it in your mouth for a few seconds before you swallow. Alcohol and caffeinated beverages dry out the mouth, so imbibe them in moderation. Tobacco is also drying, so there's one more reason among the multitude for avoiding it. Although not perfect, over-the-counter artificial saliva products may counteract xerostomia. If dry mouth is a problem, you need to be especially conscientious about brushing and flossing because of the increased vulnerability to cavities. The well-being of your aging mouth is tied to the health of the rest of your body. There's mounting evidence of an association between gum inflammation and conditions such as diabetes, heart disease, stroke, and respiratory problems, all of which are more prevalent in later life. Scientists postulate that bacteria from gum infections travel through the bloodstream to trigger inflammation in organs and tissues at distant sites. For diabetes, a disease that afflicts nearly a quarter of Americans over age 60, the cause and effect may go in both directions. Over the years, uncontrolled blood sugar damages the blood vessels that supply the gums, so they become susceptible to infection, which accelerates periodontal disease. High blood sugar also translates into increased sugar in oral fluids for bacteria to feed on. Conversely, inflammation from oral infection may increase the body's resistance to insulin, leading to greater difficulty in keeping blood sugar under control. Not keeping up with your oral health is going to cause problems at any age, but as you get older, the problems get worse. Missing and loose teeth can make it hard to eat and talk. As food choices become more limited, good nutrition and, eventually, overall health can go downhill fast. Speech problems and facial changes from missing teeth often lead to self-consciousness, social isolation, and even depression. Keeping your mouth young in old age requires diligent do-it-yourself care: brushing with fluoride toothpaste and flossing at least twice a day. Regular dental appointments are also important, although dental care is expensive, and retirement may mean losing affordable dental insurance. Surveys show that nearly a quarter of people over age 65 haven't seen a dentist within the past five years. Medicare doesn't cover routine preventive care or most dental procedures, although you may be able to get dental benefits if you're enrolled in a Medicare Advantage Plan (formerly known as Medicare Part C). However, the federal health care reform legislation may result in major changes in the services covered by the advantage plans. Another option is buying dental coverage through AARP, the senior citizen organization. The cost of individual coverage ranges between $30 and $55 per month depending on the level of benefits and where you live. If you don't have insurance and the out-of-pocket costs are too steep to shell out in one chunk, some dentists provide a credit plan that allows you to pay in monthly installments.